Today I traveled to New York City by the way of the New York Tribune (January 20, 1915). 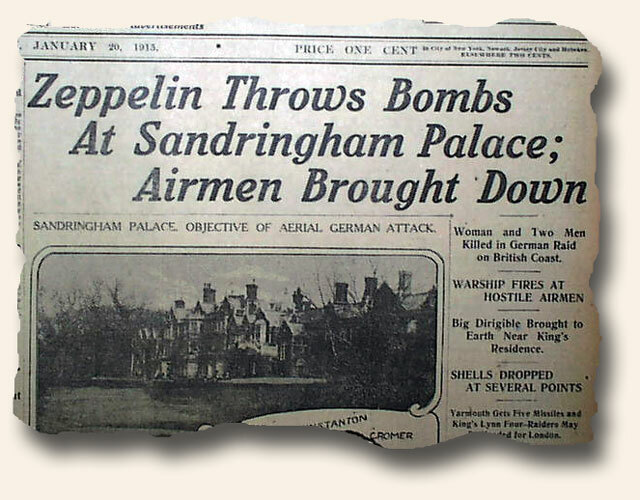 There I found the headline “Zeppelin Throws Bombs At Sandringham Palace; Airmen Brought Down.” This was the reporting of the first time that Great Britain had been bombed by zeppelins, attaching them at night. 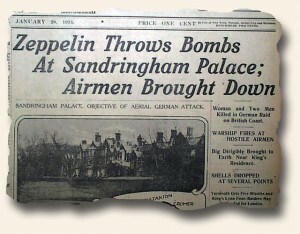 Sandringham was one of the royal residences. Another article on the front page was of a witness to the death of a bride almost a year ago surrendered herself to authorities. They thought that she had fled to Europe, only to find that she had found it easy to hide within New York City itself!